RIVNUT® blind rivet nuts and RIVSTUD® blind rivet studs are a versatile solution for fastening a load-bearing nut or bolt thread to thin-walled components where cut threads are not an option. 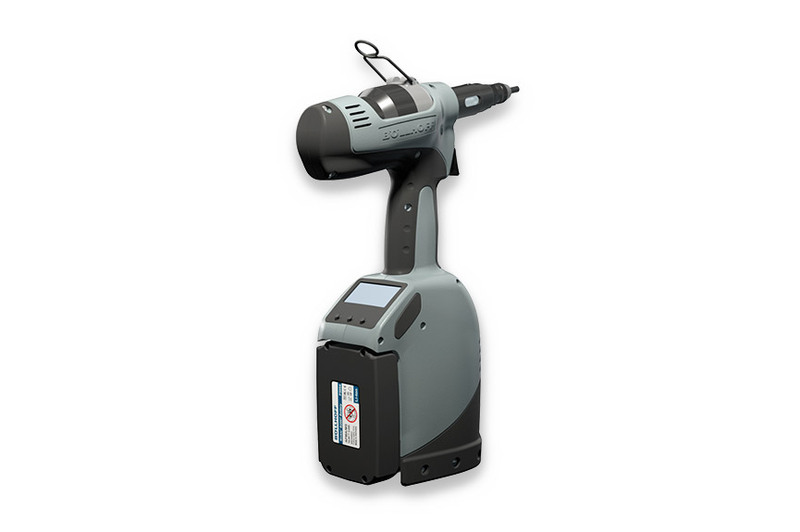 For optimum processing, we offer a wide choice of tools – from manual to automated. RIVNUT® blind rivet nuts and RIVSTUD® blind rivet studs make it possible to create internal and external threads on thin-walled components. These elements are mounted without counter pressure ("blindly") and can therefore also be set at hollow sections. 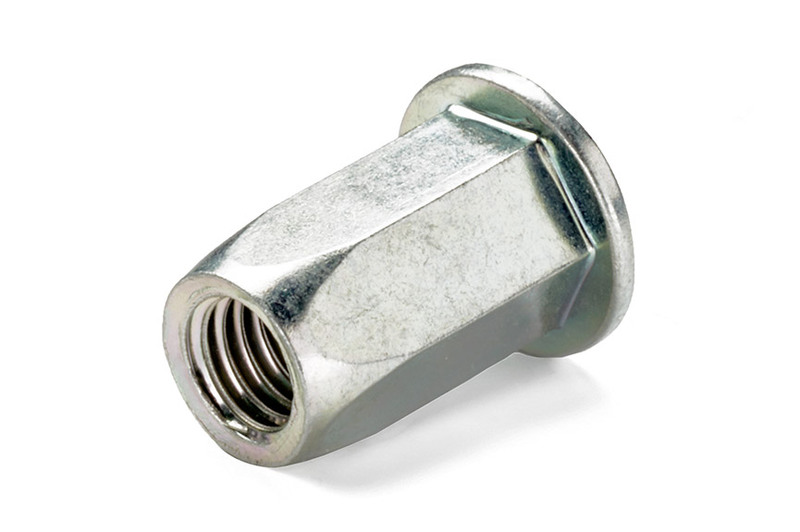 RIVNUT® blind rivet nuts and RIVSTUD® blind rivet studs are hugely versatile. They are used, for example, in the automotive industry, rail engineering, medical technology, electrical engineering, the solar industry and in industrial kitchens. Here the RIVNUT® blind rivet nut or RIVSTUD® blind rivet stud is spun on, compressed and then spun off. The product tables in our RIVNUT® catalogues serve as a guideline for adjusting the setting stroke S to be used with a particular RIVNUT® blind rivet nut or RIVSTUD® blind rivet stud to ensure optimal riveting. The advantage is a fast and simple process. 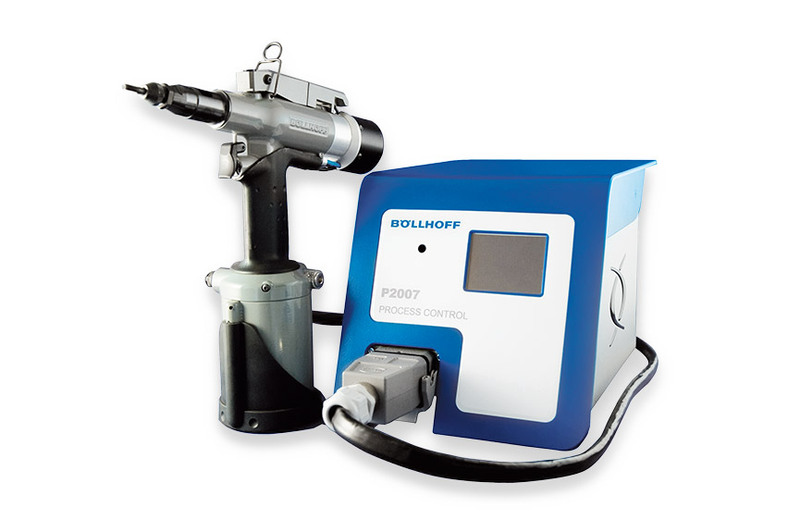 In the pressure setting method, the riveting tool generates its maximum setting force over the entire operating range. Consequentially, in some cases the tool setting causes blind rivet nuts and studs to be fastened too tightly or too loosely, due to different component thicknesses. This phenomenon is prevented with the pressure setting method, since the riveting force is generated and controlled independently of the workpiece thickness. Advantages: Optimised riveting in workpieces of differing thickness and repeated setting of a RIVNUT® is possible. In force-controlled riveting, the service life of the mandrels increases. 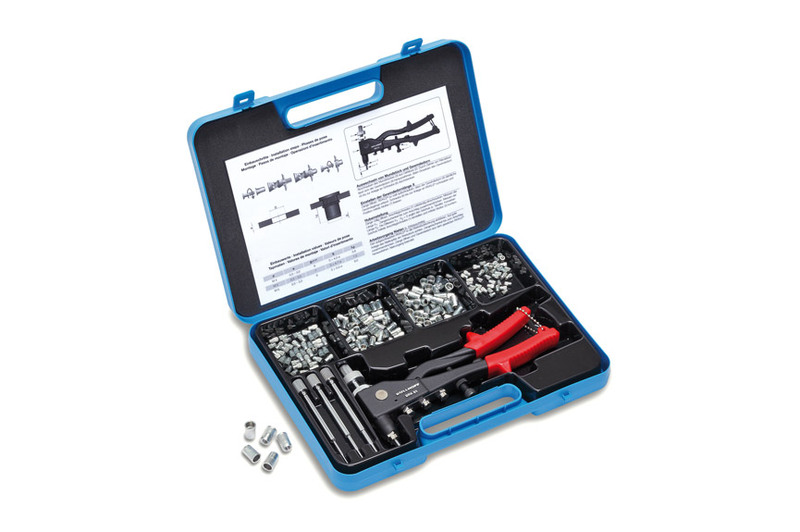 Manual installation tools for RIVNUT® blind rivet nuts and RIVSTUD® blind rivet studs. Hydraulic tool for stamping hexagonal sockets and setting RIVNUT® blind rivet nuts (M 5 to M 8). Creation of hexagonal sockets from round drill holes and setting of RIVNUT® blind rivet nuts. Manual setting tool for use with RIVNUT® blind rivet nuts (M 5 to M 12). Spin-on and spin-off with ratchet function. 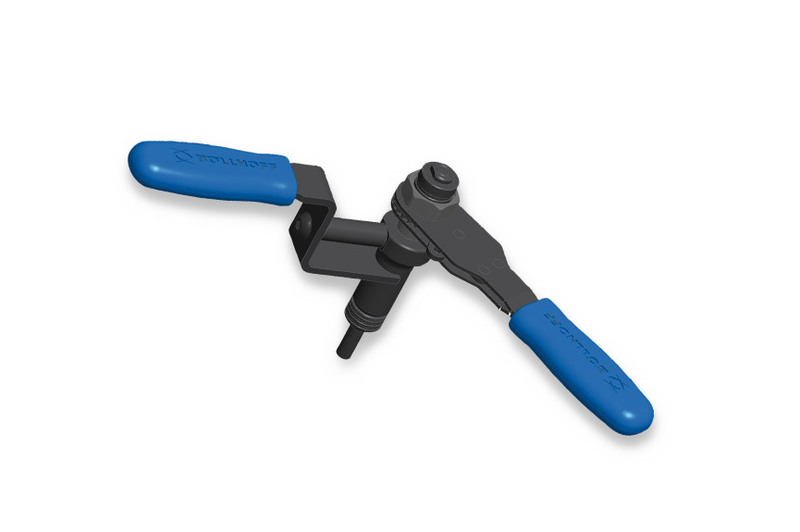 Lever setting tool for use with RIVNUT® blind rivet nuts (M 3 to M 6). 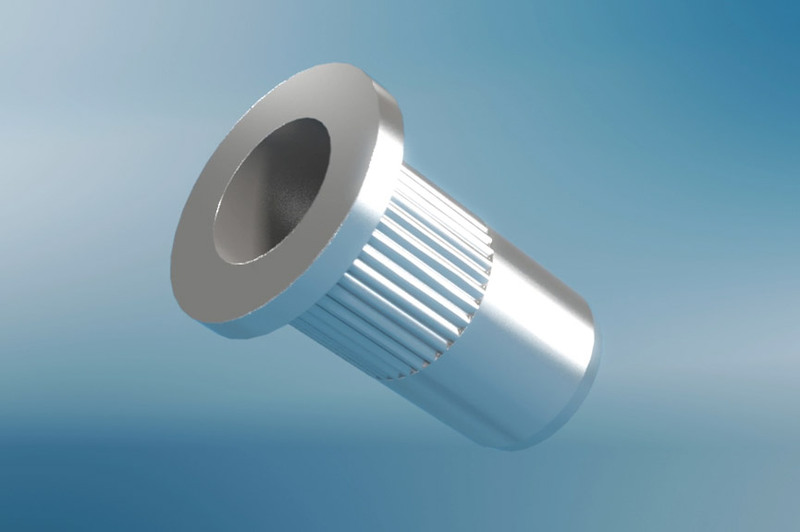 Rivet spin-on and spin-off with knurled nut. Compression by lever action of manual tool. Lever setting tool for use with RIVNUT® blind rivet nuts and RIVSTUD® blind rivet studs (M 5 to M 10). Rivet spin-on and spin-off with drill spindle. Riveting by optimal lever action. Practical quick stroke adjustment. 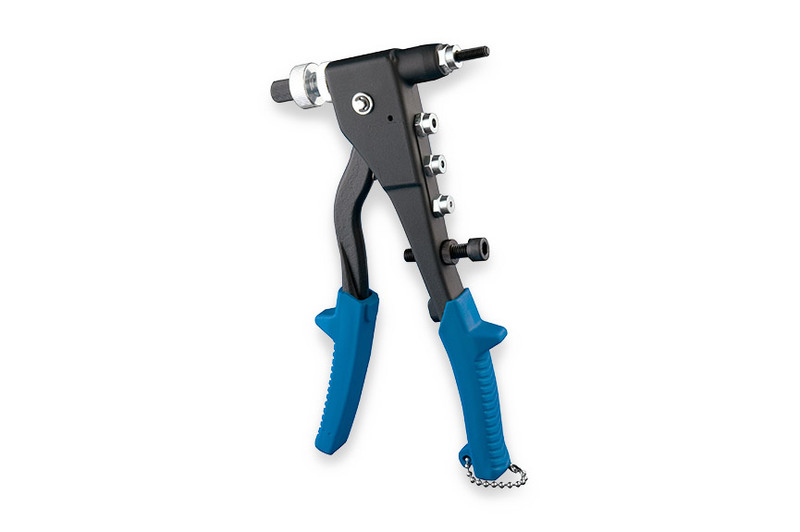 Hydraulic lever setting tool for use with RIVNUT® blind rivet nuts (M 6 to M 14). Rivet spin-on and spin-off with crank. 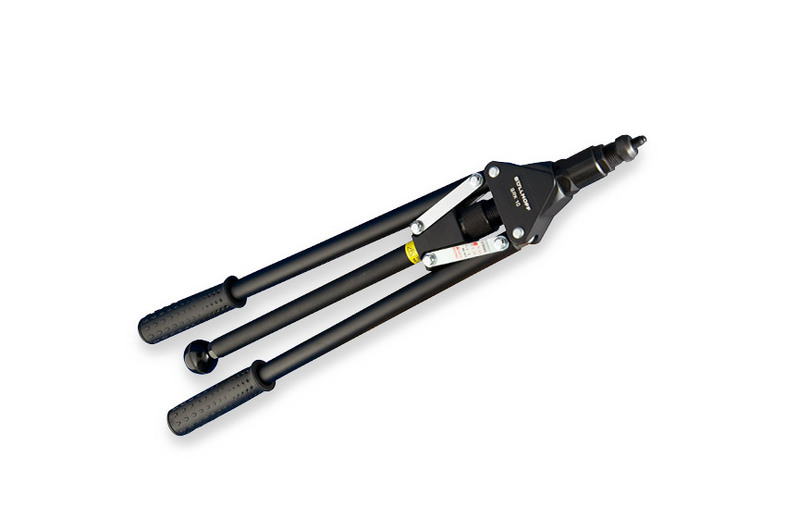 Compression by gentle lever action supported by integrated hydraulic pump. Mechanical installation tools for RIVNUT® blind rivet nuts and RIVSTUD® blind rivet studs. 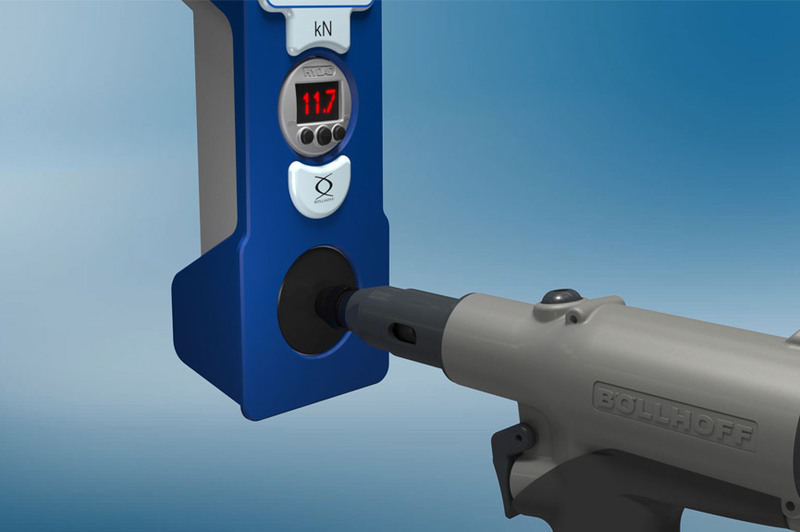 Battery-operated setting tool with innovative electro-hydraulic technology for use with RIVNUT® blind rivet nuts and RIVSTUD® blind rivet studs (M 3 to M 10). 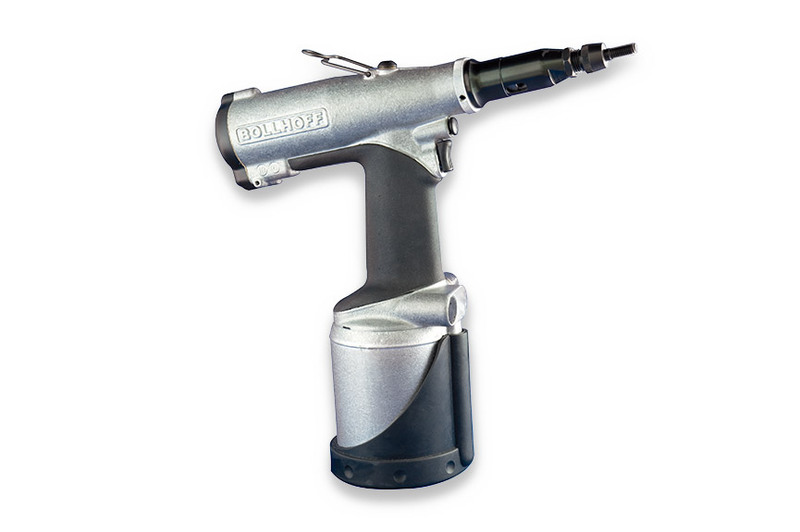 Its cordless design makes the RIVNUT® B2007 extremely flexible. Lithium‑ion battery technology ensures an adequate operating life. Designed for challenging industrial use. Hydraulic-pneumatic setting tool with force control for use with RIVNUT® blind rivet nuts and RIVSTUD® blind rivet studs (M 3 to M 8). 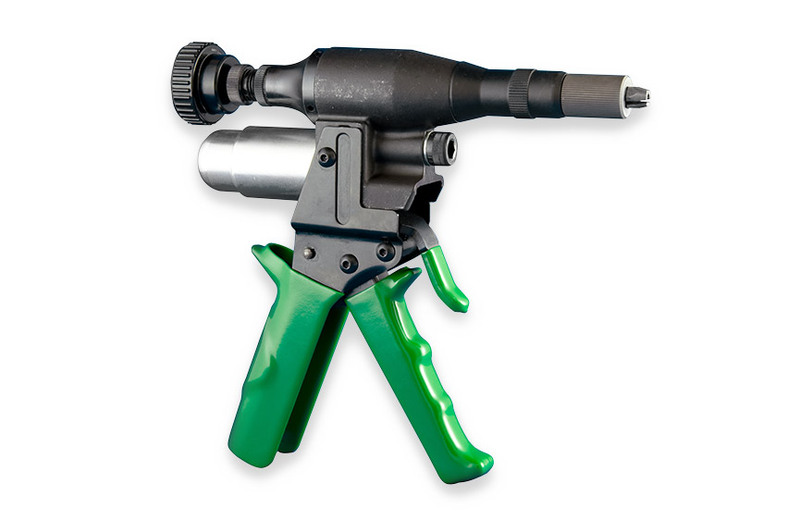 Multi-dimensional pneumatic-hydraulic tool for use with RIVNUT® blind rivet nuts and RIVSTUD® blind rivet studs. Spin‑on of blind rivet nuts and studs by automatic touch. 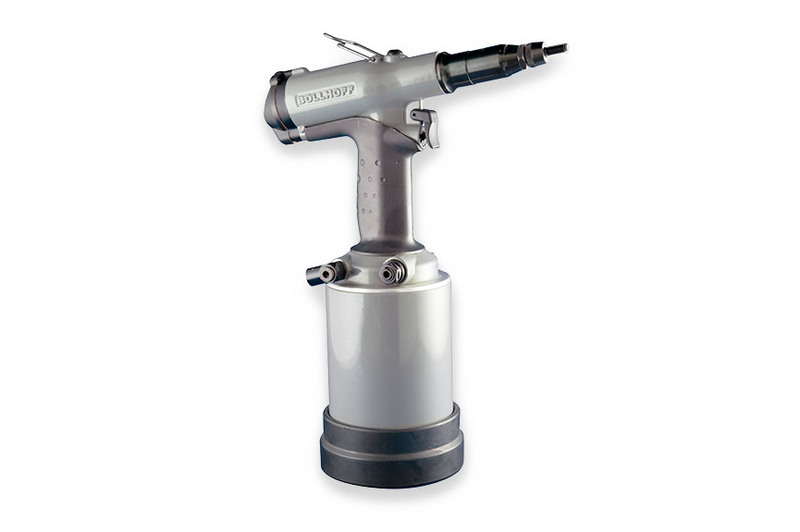 Riveting performed with just one actuation switch. Force-monitored installation, colour-coded force setting. Hydraulic-pneumatic setting tool with force control for use with RIVNUT® blind rivet nuts and RIVSTUD® blind rivet studs (M 4 to M 12). Force-monitored installation. Colour-coded force setting. 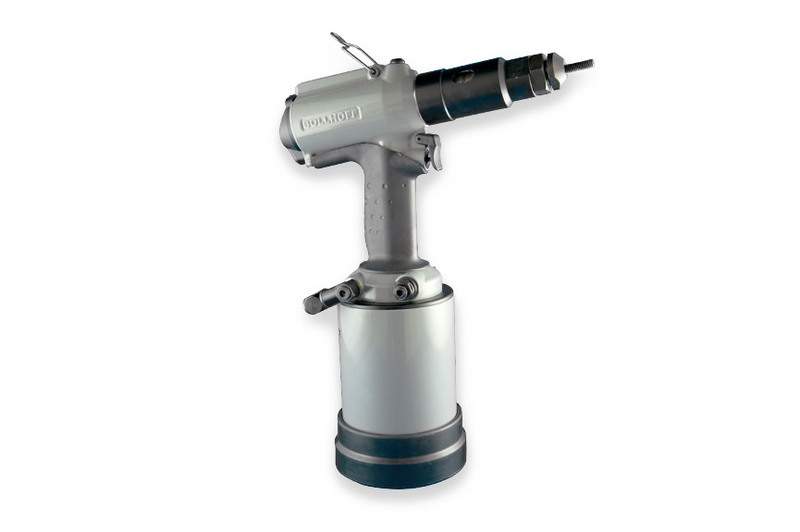 Hydraulic-pneumatic setting tool with force control for use with RIVNUT® blind rivet nuts and RIVSTUD® blind rivet studs (M 8 to M 16). Multi-dimensional pneumatic-hydraulic tool for use with RIVNUT® blind rivet nuts and RIVSTUD® blind rivet studs. 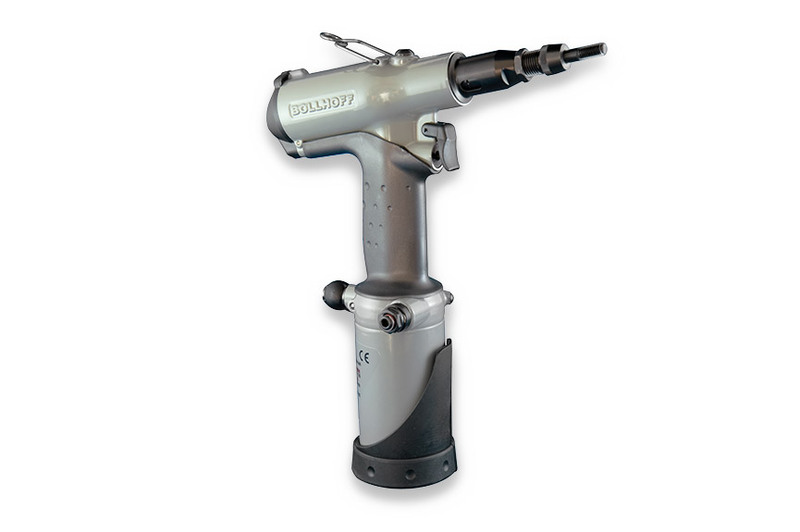 Spin-on of blind rivet nuts and studs by automatic touch – riveting performed with just one actuation switch. 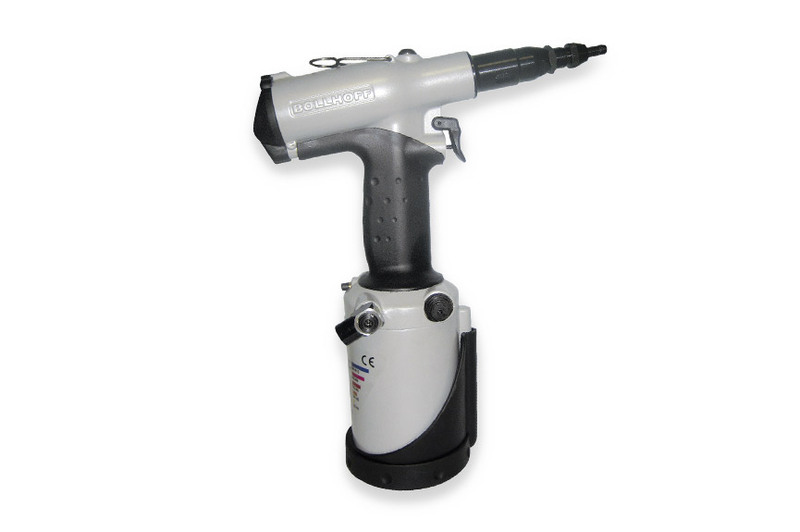 Hydraulic-pneumatic setting tool with stroke control for use with RIVNUT® blind rivet nuts and RIVSTUD® blind rivet studs (M 3 to M 12). Multi-dimensional pneumatic-hydraulic tool for use with RIVNUT® blind rivet nuts and RIVSTUD® blind rivet studs. Spin-on of blind rivet nuts and studs by automatic touch. Stroke setting with setting ring. 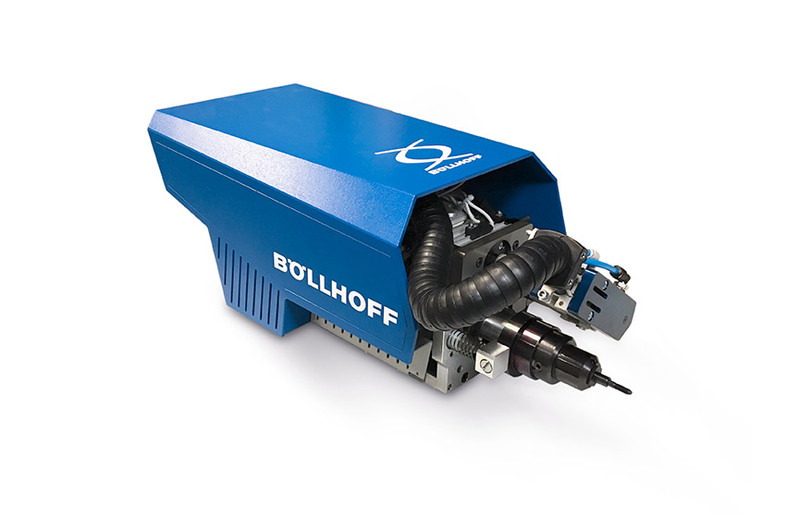 Hydraulic-pneumatic setting tool with force control for use with RIVNUT® PN blind rivet nuts and studs (M 4 to M 10). Multi-dimensional pneumatic-hydraulic tool for use with RIVNUT® PN blind rivet nuts and studs. Spin‑on of blind rivet nuts and studs by automatic touch – riveting performed with just one actuation switch. Hydraulic-pneumatic setting tool with force control for use with RIVNUT® PN blind rivet nuts and RIVSTUD® blind rivet studs (M 8 and M 10). Multi-dimensional pneumatic-hydraulic tool for use with RIVNUT® PN blind rivet nuts and RIVSTUD® blind rivet studs. The RIVNUT® EP X009 – for correct and reliable riveting. 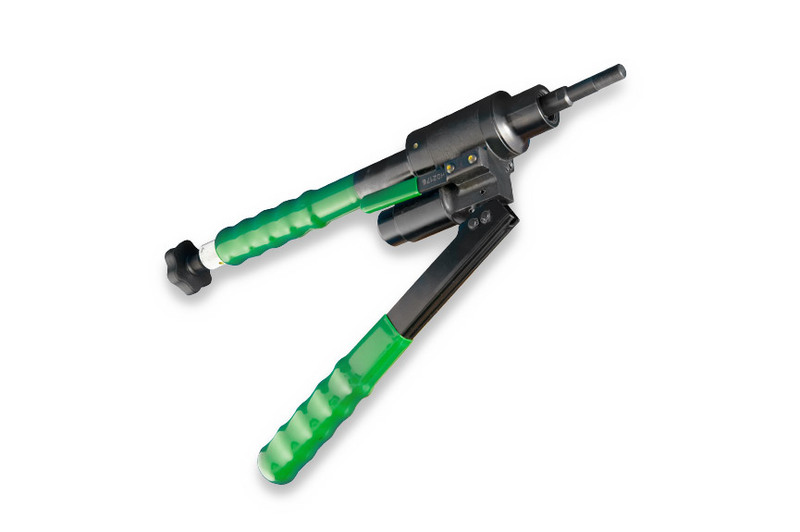 Suitable for use with our mechanical installation tools RIVNUT® P1007, P2007, P2007 PN, P3007 and P3007 PN. Automated setting tools for RIVNUT® blind rivet nuts and RIVSTUD® blind rivet studs. Hydraulic-pneumatic setting tool with process control for use with RIVNUT® blind rivet nuts and RIVSTUD® blind rivet studs (M 4 to M 14). 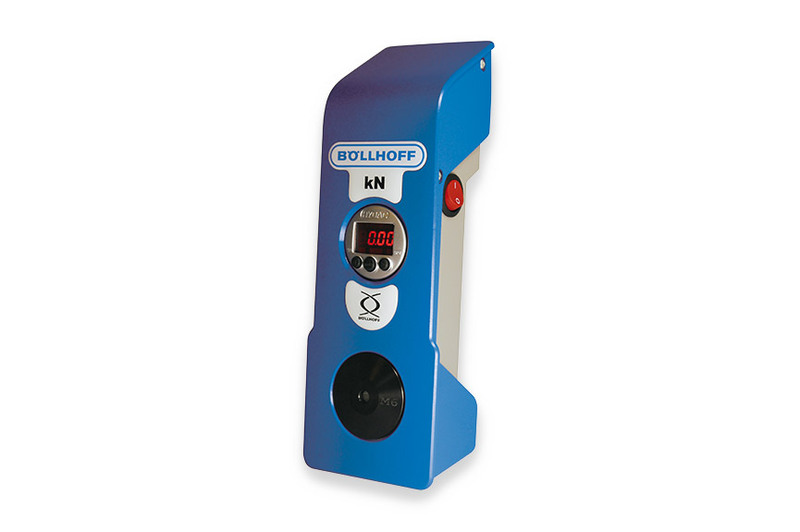 Pressure-regulated, path-monitored tool for complete quality control of the riveting process, with fault warning signal. 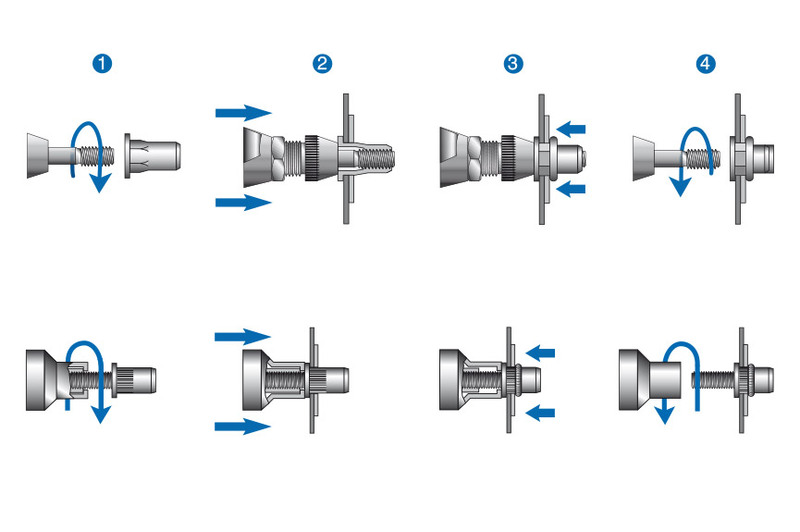 RIVNUT® spin-on by automatic mandrel touch, automatic spin-off after riveting. Component-specific counting function. Multilingual menu navigation with touch screen. 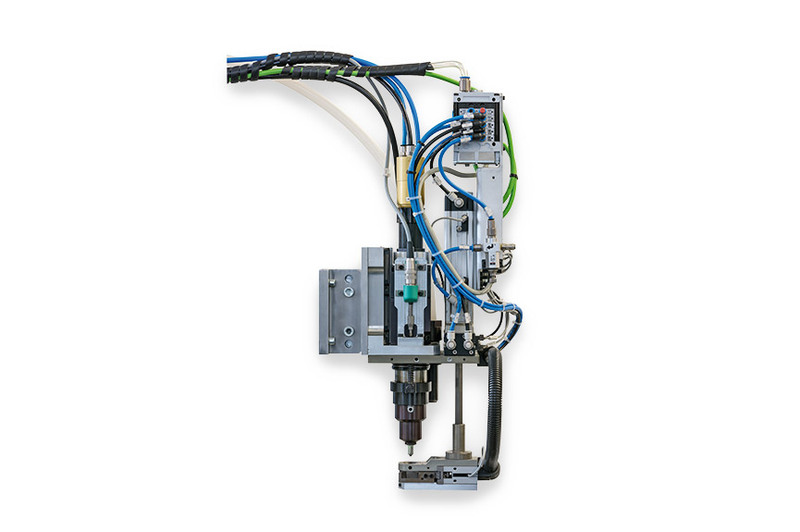 Automated riveting process. RIVNUT® EPK is available in the versions EPK C (M 4 to M 10) and EPK HP (M 8 to M 14). 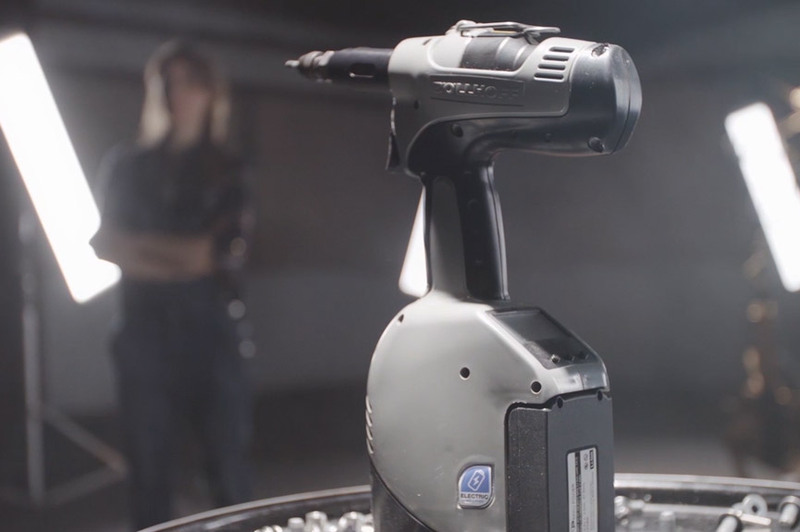 The EPK C version can optionally be supplied with a gun- or bar-style setting head. The EPK HP is available as a bar version and is similar to the EPK C but with a higher riveting force. Automatic setting head (spindle lifting principle, hydraulic-pneumatic) for use with RIVNUT® blind rivet nuts and RIVSTUD® blind rivet studs (M 4 to M 10). This setting head is suitable for the automated installation of blind rivet nuts and studs, even for components with access only from one side. The RIVNUT® blind rivets are fed by means of vibrating spiral conveyors or other distribution systems. 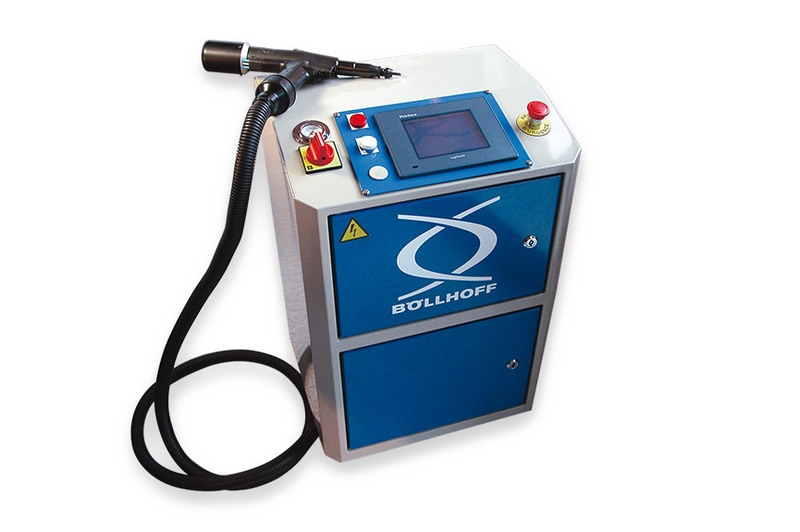 The tool features integrated process control. RIVNUT® blind rivet nuts and studs with hexagonal shank can be fed in the correct orientation straightaway, without problem, and then processed. Feed-in and riveting is possible in all spatial orientations, even upside down. For integration into automatic production processes – large-scale production, high quality standards, safety components. For optimising the setting of force-controlled mechanical installation tools – RIVNUT® B2007, P1007, P2007, P3007, P2007 PN and P3007 PN.